Listforge is the first network of server lists for sandbox, survival and indie games. Covering 33 games (more coming) and tracking more than 74,942 servers, our server lists are the most advanced and complete with tons of features. In July 2015, our different sites received more than 4 400,000 visitors. 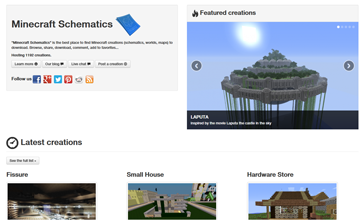 "Minecraft Schematics" is the best place to find Minecraft creations to download.